Another cable-stayed Bridge in Colombia. After this bridge collapse in my country..
Now we bring the "Hisgaura Bridge" that folds up and down like an accordion. The national news begins with this document leaked through Whatsapp. What do you think ? It's only cosmetic or its form can lead to it's failure. RE: Another cable-stayed Bridge in Colombia. This should be interesting. This article https://vaaju.com/colombiaeng/deficiencies-in-hisg... indicates that a "load test" is pending. I claim no expertise, but it appears to me that they are far from ready for that. Well, a load test should of course be performed, and a very complete and satisfying one. But before, those undulations should be explained and repaired: are they due to an incorrect tension of the cables? Yikes. Wouldn't want to be the photographer. Looks like it's a little out of tune is all. I think the photo posted is misleading. Then undulations seen above are intentional, as seen in the photo below. The concrete is cast with those angles, but the concrete appears to have needed repairs. However, the second attached photo shows the roadway with a rather disturbing cant, as well as undulations. I couldn't open the attachment. the accented A appears as a strange symbol which may be preventing download? Try again without it? that's a very odd picture alright. Try this link. I removed the accented A. The famous Millau Viaduct in France was a bit twisted before they brought it into alignment (not as bad as the subject of this thread). I recall this detail from a documentary on the subject (PBS Nova?). What is the problem? The average deck height looks fine. I can't imagine it is intentional. There is tremendous axial force in the deck/superstructure from the horizontal component of the stay forces. Not having that force in a linear plane would cause immense localized stress at each lower anchorage that was vertically offset from a subsequent one. I've never seen a geometry like that on a stay cable bridge. The deck/superstructure looks "flimsy" (that is an engineering term) for the compressive load, especially from the distant view. Is it just me or does the horizontal tie below the deck (tying the bottom of the A frame together) look way undersized? 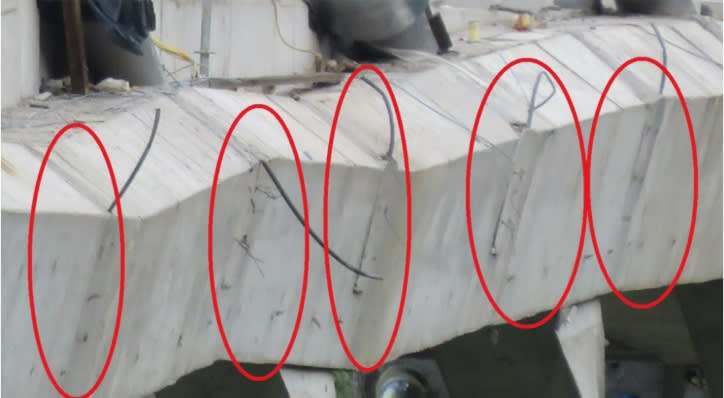 The previous Colombian cable-stayed bridge had a concrete diaphragm, but examination of the debris photos (very little rebar projecting from the junction of the diaphragm and the columns) suggests there was inadequate horizontal tie capacity under the deck. This one has a tie beam, but it just doesn't look big enough when you compare it with the size of the main A-Frame columns. I'm not sure that the tie-beam capacity is related to the deck undulations - but I'd suggest a thorough design review before they put this bridge into service. 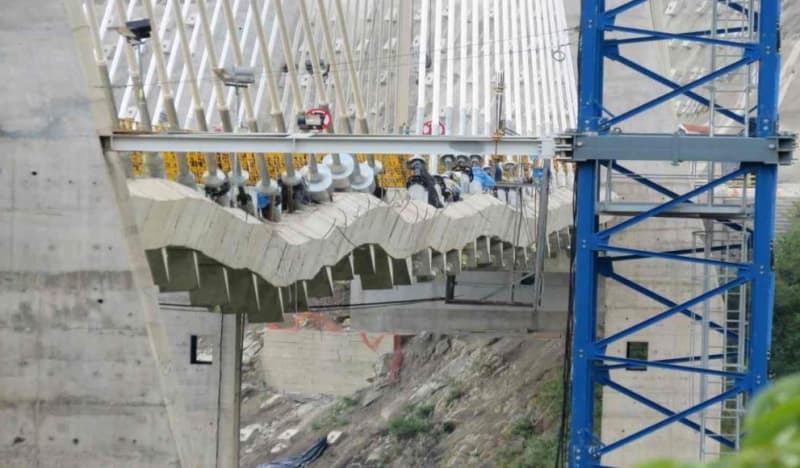 The Millau Viaduct was launched as a continuous multi-span box girder across the towers, which is the stage that the photo shows. For the launching of the deck, temporary steel towers halved the distance that the deck girder had to span until the cable stays were installed. The deviation that you can see in the photo is the sagging of the continuous box girder spanning half of its final span BEFORE the cable stays have been installed. The solitary cable stay pylon that is shown supported the cantilevering deck units as the whole deck was launched from the abutments. The intermediate cable stay pylons were installed after the whole deck had been launched, to straighten the deck alignment and carry the live loads etc. Wow, that's a mess. The only next step anyone should be considering is demolition. Trying to justify it's continued existence by some load tests just seems like a fools errand. If the construction company cared so little about what could be seen, then what else is hidden that could cause a failure in the near future? I don't see how it could be easily fixed. It appears they managed to build a "flat-ish" deck over that rippled supporting structure. Seeing these pictures better explains how the last collapse happened. I thought it was funny that in the deck pictures there appears to be a wheeled construction equipment type box in the low spot of the deck. I wondered if it was put there on purpose or had found it's own resting spot. some more data and a nice video on the building. This one says it is to be demolished! This one has vehicles on it! Also a lot more in Spanish. If anyone can effectively translate? The National Institute of Roads and the Adaptation Fund reported that the load test of the Hisgaura bridge, which presents some faults in its construction, will not be made until the structural verification report of the work's designs is analyzed. Although the report on how the mega-project was built was announced by the Technical Studies and Advisory firm (ETA) , the Invías and the Adaptation Fund informed that the loading test will not be authorized with 14 double-deck vehicles, until it is reviewed. In detail, the document and define a timetable for it. "The conclusions of these tables will be taken no later than November 29 and sent to the contractor, who is to present the schedule of the load test" , reported the Adaptation Fund. Initially it had been known that the date to execute the load test, which would define if the Hisgaura bridge would be put to use, was set for Monday, November 19, however, and after information from the National Government, this process will not be done. "We have not known an official date when the load test will be done, we have not received a document as to when it could be done, but we are waiting for it because that would define many things regarding the operation of the bridge, which would improve the connection of Santander " , said Julián Pedraza, mayor of the municipality of San Andrés. On the faults in the construction of the Hisgaura bridge, the Comptroller General's Office warned that in addition to the undulation in its structure , the lighting of the bridge was not included in the contract, when usually there is an intense fog after four in the afternoon. LittleInch - the bridge picture in your last link doesn't appear to be the bridge in question. "The Government seeks to be clear about the real capacity of loading this structure, which has been criticized for the irregular shape of one of its sides." So, one side is straight? The images showing vehicles on the bridge appear to be computer renders. We may never see pictures of this particular bridge carrying live traffic. El Gobierno busca tener clara la capacidad real de carga de esta estructura, la cual ha sido criticada por la forma irregular de uno de sus costados. The Government seeks to be clear about the real capacity of loading this structure, which has been criticized for the irregular shape of one of its sides. Could this just be a translation issue, and the original actually means "the irregular shape of one of its spans", rather than implying irregularity from side to side? No confusion with the word costado/costados... it means side/sides about any way you cut it. Lapso would be a more appropriate choice if they meant span (in relation to a bridge). I seem to recall that one of the articles mentioned something about the UPSTREAM side vs the DOWNSTREAM side, which leads me wonder if one side is relatively straight, while the other side has an artistic flair of random undulations, and would also corroborate that it is the 'sides' that is correct. Are there pictures of both sides of that span? I'm not in a place where I can surf easily, so I'll have to dig around later. 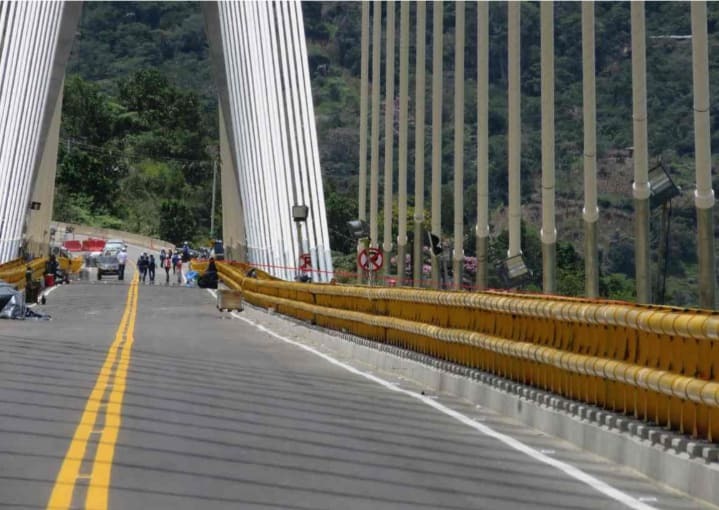 I didn't realize that Frank Gehry was living in Colombia and was designing bridges. I think there are some very brave people in Colombia. Were the design engineers on the bridge with the trucks? Those tie beams still look very puny. Was that some kind of load test? What was the point? Six of the seven trucks had tarps over the dump box. I hope someone checked the load. Was that an optimistic vulture circling somewhere around the 18s mark?